Last edited by tuner357; 04-29-2011 at 05:27 PM. I've had friends run KYB's and they've loved them. I know a few people who ran Tokico blues and blew them but that's because they're OEM replacements. I've heard some good things about the illuminas. Can't go wrong with either brand. They both have a good reputation really. I've had a set of KYB AGX's on my 4th gen for about a month now, and absolutely love them. So thats my suggestion. I'm running. Agx on my fourth gen as well, they ride really nice. Im going to get illuminas with GC coils...BigLegs on here has them. Ran agx on my fourth as well and had a 2.5 in drop. No problems at all four about a year and a half. 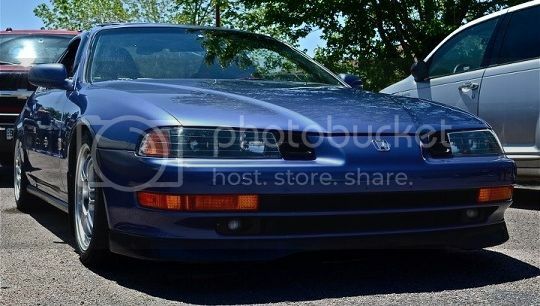 1988- Honda Prelude Si 4ws Jdm b20a swapped. I'll vouch for KYB...it's JDM yo! I've had tokico blues on my daily for like 4 years and have never had a problem em..
ya i want like maybe a 2.5" drop max. i think im just gonna go with a 1.5" drop tho. how do you guys think thatll look? not enough of a drop? Ok since we're on the suspension topic can I get a suggestion on your prefered set up for dropping a load... My 96 I lowered about 1.5-2 in.. Its been a while but I know a few years back I threw some tiens on it. Its sooo rough. What do you do to avoid a bouncy or rough riding drop? I said id never ever lower my 01 for the simple fact or bounciness. Also maybe favorite wheels... I had tenzo r shu 4s on my 4G and obviously I cannot put them on my 01 or I would. I still love those wheels. both kyb and tokico are quality shocks. imo, anything over 1.75 is over doing it. any lower and you start to loose suspension travel which actually makes suspension more harsh and unpredictable and worsens your handling. with tokicos, i wouldn't go over 1.5". anything over 2" is pure aesthetics.. why people like that look is beyond me. but then again i'm about function over form. what shocks did you have with those tiens? i'm not a huge fan of mixing manufacturers. either way, anytime you lower your car it's gonna require stiffer shocks and springs. it's just the natural order of things. the preludes suspension is already pretty stiff as it is. the closest setup to stock imo is tokico. they basically are stock replacement. however, it only drops you about an 1-1.2 inches. because i got something better.